Atlanta,GA: One of the newest members of the University System of Georgia’s governing body hangs a Georgia Tech Civil Engineering degree on his wall. Gov. Nathan Deal appointed Sachin Shailendra, CE ‘01, in April. He’s now one of the 19 members of the Board of Regents (BOR), who set policy forGeorgia’s 31 state universities—from establishing tuition rates to hiring campus presidents. The board also oversees the Georgia Public Library System and the Georgia Archives. “Education is the biggest thing in life, and I like helping people,” Shailendra said this week. “I am highly honored to have been appointed to the prestigious Board of Regents. Shailendra is president of SG Contracting, a full-service construction management and general contracting company based inAtlanta. He has been involved in the construction industry for most of his life, but he said he’s not so far removed from his time on campus that he has forgotten what it was like to be a student. “I want to do anything I can to help students,” Shailendra said, noting he still remembers the rigors of his studies at Tech. Shailendra is involved in a wide variety of community organizations, including the boards of the Atlanta Opera and the Children’s Healthcare Sports Network. He’s also on the advisory council forWoodwardAcademy, his alma mater. And he said his appointment to the BOR is another way of giving back to the system that gave him a top-notch education. So far, Shailendra has participated in two BOR meetings, and he said he’s working through a mountain of reading material to get up to speed on all the issues before the board. He said he has been assigned to a group that handles academic affairs; law issues, such as the formal grievance process; and personnel and benefits. Shailendra will serve a seven-year term. Sachin is the son of well knownAtlantaentrepreneur, philanthropist Shi Shailendra and Kiran Shailendra. 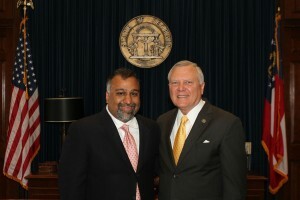 Sachin’s brother, Paul Shailendra, was appointed to the Board of Natural Resources by Governor Deal last year.